Notes: A manga spin-off by Nanten Yutaka and Yadate Hajime (the stock pseudonym for the Sunrise collective) is now available from TokyoPop. Spike Spiegel is a bounty hunter with a dark, violent past. Nowadays, he roams between the seedier colonies of space along with his partner Jet Black and their spaceship Bebop as they try to catch a bounty or two, barely making a living at it. Some of their bounties, like the mysterious Faye Valentine and the intelligent 'data dog', Ein, end up as fellow partners. Is Spike trying to justify prior misdeeds by working for the right side of the law? What will happen when his past catches up to him? And what of the pasts of his fellow shipmates? Will any of them survive long enough to find out? Cowboy Bebop has been often referred to as the new anime noir, a title that does fit, but doesn't even begin to fully describe it. Equal parts film noir, spaghetti western, and 70's cop show; Cowboy Bebop is both retro and fresh at the same time. A very stylish, beautifully crafted series that deserves much more attention than it gets. 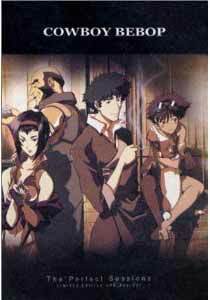 If ever there was a series more deserving to be a sleeper hit, Bebop is it. Cowboy Bebop is well suited to TV. Each episode manages to stand alone, but at the same time link together an overall larger story. Even if you only see two or three episodes, not exactly in order, one wouldn't be lost, and would find enjoyment in them. In order to truly appreciate it, though, one must see it through. Cowboy Bebop also presents a realistic view of the future. Spike and Jet travel in what to us would be a highly sophisticated craft, but to them is the modern day equivalent of a 1976 El Camino. The places they visit are far from what one would expect. Instead of Neo-Tokyo with its shiny, impossibly tall skyscrapers that never end, we have Neo-Tijuana, with its dusty dirt roads, run down shacks and migrant workers. Space is ethnic, but not in the Star Trek sanitized for the sake of politically correctness way. Each colony reflects a melting pot more akin to Los Angeles or New York City than any Blade Runner wannabe ever could. The animation is beyond superb. Its quality excels over most current releases. Cowboy Bebop uses computer graphics, but does so in such a fluid, breathtaking manner. There are practically no scenes that feel 'artificial', like what's going on in the foreground is totally separate from the background. Many computer-generated anime can't seem to shake the look that the characters are just floating in front of the background stills. Everything in Cowboy Bebop seems to breathe with life and motion, even in otherwise stoic scenes, and it's a rarity and a marvel to behold. Then there's the storyline. Even though each episode stands quite well on its own, with poignant moments interspersed with exciting action, the underlying theme of Spike Spiegel and his motivations for what he does is absolutely intriguing. With each flashback, you get one more piece of the puzzle, from Spike's shady origins to the loves that influenced the way he is. Maybe his bounty hunting is really a search for identity as much as a way of life he has chosen. The plot and characterization in Cowboy Bebop have a sophistication and subtlety that is practically one-of-a-kind. It's hard to find movies this involving, much less animated television series. Cowboy Bebop simply puts most anime...and Hollywood, to shame. On the surface, it's easy to dismiss as '70s retro fluff. "Hey, there's Vega$ all over again!" And yes, many a Japanese and American movie star or feature is lampooned in one form or another during each episode. Cases in point: Spike Spiegel is a postmodern Lupin III. And in the first episode alone, Asimov Sorenson and Katarina.... can we say Desperado, kids? (Heck, even Quentin Tarantino seems to have a cameo!) But beneath that noir veneer is a very human drama that has just enough humor and clever dialogue to be realistic, yet highly entertaining. This is a must-have for any serious collector of Japanese animation. Simply put, this anime is one of the best. Recommended Audience: Well, after the first episode, Spike Spiegel says it's "family fun for all", but that isn't quite the case. ^_^;; It has plenty of mature themes, with the hard, violent life of a bounty hunter leading to many an intense situation. People do die, sometimes graphically, but never gratuitously. And Faye IS a femme fatale, though not as much of a fan-service object as one would expect. Kids may find the pop-culture spoofing hilarious and Ein cute (well, he is ^_^), but this series would really go right over the heads of most under-twelves. Mature teens and above would understand the underlying point of the story, though.